Researchers from Swiss technical university Ecole Polytechnique Fédérale de Lausanne have created a prototype for telescopic contact lenses, and have developed the technology to allow them to be controlled by winking. Lead researcher Eric Tremblay's first telescopic lens was unveiled in 2013, but since then a team has been exploring ways to make the technology more usable and comfortable. Each contact contains an ultra-thin reflective telescope inside its 1.55-millimetre-thick lens. Tiny mirrors within this bounce light around to create a magnifying effect similar to looking through low-magnification binoculars, offering a 2.8-times zoom increase. The latest update to the project pairs the lenses with an accompanying set of glasses that recognise eyelid movements, using a combination of electronic circuitry and small light detectors. Worn together, the user can turn the zoom function on and off by winking. The wearer winks their right eye for magnification and the left eye for normal vision. These eye movements instruct the glasses to alter the angle at which the light enters the two apertures of the contact lenses. The films that replace the traditional lenses in the eyewear are able to electronically select a polarisation of light – the direction in which the light waves are oscillating. The lenses are designed to allow one type of polarisation into the aperture that creates the 2.8-times zoom and another into the aperture that provides normal viewing. When the polarisations passing through both the glasses and the lenses match, the wearer is able to see. The contacts themselves comprise precision-cut plastics combined with aluminium mirrors and polarising thin films, attached with biologically safe glues. 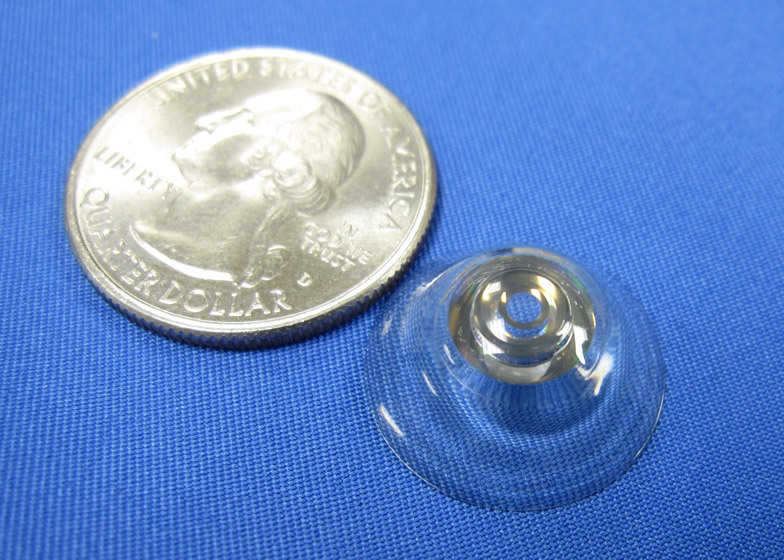 But unlike the soft materials used for regular contact lenses, these are manufactured with a rigid, larger lens called a scleral lens to accommodate the mechanism. At present the researchers are exploring ways in which they can make the lenses more breathable so that they can be used for a longer period of time. One option included fitting the lenses with 0.1-millimetre-thick air channels to allow oxygen to circulate through the mechanism and reach the cornea. The team admits more work needs to be done to improve image quality and oxygen permeability, but as mechanical and manufacturing processes improve, so too could results in these areas. The Defense Advanced Research Projects Agency (DARPA), the research wing of the American military, is providing funding for the project. "The combination of the telescopic contact lenses and optional blink-controlled eyewear represent a huge leap in functionality and usability," EPFL said in a statement. The team hopes advancing this kind of optical technology will be able to combat the effects of age-related macular degeneration, the number one cause of blindness among adults in the western world.